When I was in high school all I wanted to do was ‘grow up’ and move out on my own. I thought life on my own would be so cool. Don’t get me wrong I loved my family and had good friends, but I wanted an adventure and I wanted freedom. As soon as I graduated, I moved out and life has been an adventure, to say the least, ever since. One thing that I would tell my younger self, if I could, is to appreciate that family time. Now that all of my siblings and I are adults, we are scattered all over the country. Family time, as we once knew it, as just the five of us, no longer exists. Now we all have families of our own, and because of our new lives and obligations, it gets harder and harder for us to get together. This month my brother and nephew celebrated birthdays, and because of life and living far apart, I won’t be able to celebrate their birthdays with them in person. In fact, it has been a long time since I have celebrated a birthday with any of my siblings. But I guess that is the circle of life. Growing up. Moving on. Having your own family. Luckily, even though there are thousands of miles between us, with modern technology, I can still send birthday wishes! 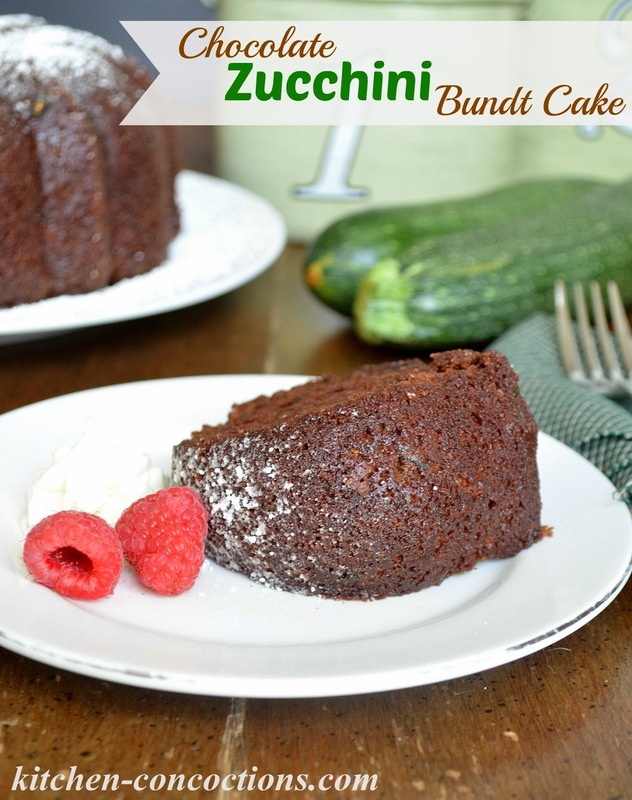 If my brother and nephew lived close by I would make this Chocolate Zucchini Bundt Cake just for them! This cake was the recipe chosen for August as part of the Lick the Bowl Good Cookbook baking group. It is a fantastic way to use up any lingering zucchini that maybe hanging around your late summer garden. 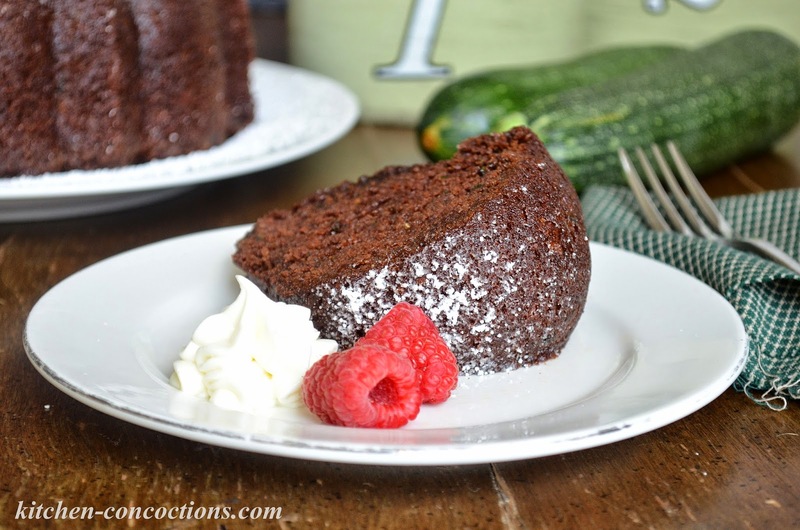 This cake is chocolaty and moist due to all the zucchini and dusted with powdered sugar. I lighted up the original recipe quite a bit, because I was taking it to a dinner party where several guests don’t like overly sweet desserts and it was still delicious! In fact, I know that even my veggie hating brother wouldn’t be able to deny a few pieces of this cake! 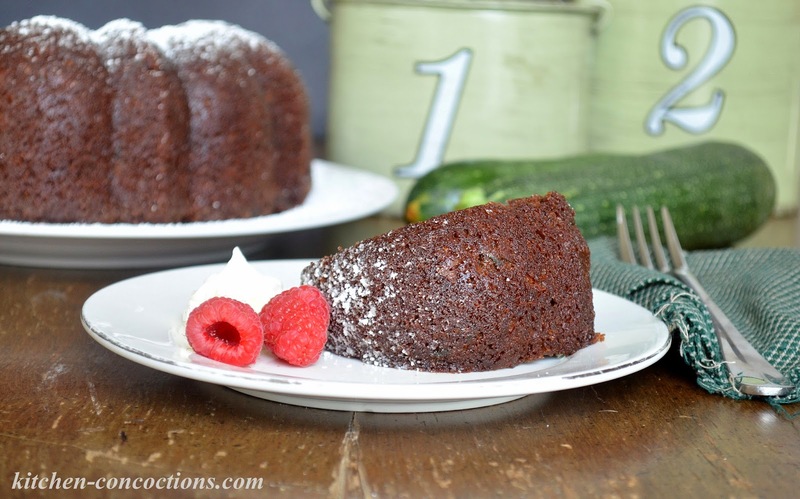 A chocolaty, moist Bundt cake filled with zucchini and dusted with powdered sugar. Using the 2 tablespoons of room temperature butter, generously butter the inside of a large Bundt pan. Dust the inside of the buttered Bundt pan with 2-3 tablespoons granulated sugar. Swirl sugar around the pan to evenly coat the pan and tap out any excess sugar. Set aside. In a small bowl, whisk together melted butter, oil, vanilla and applesauce. Set aside. In a medium bowl, sift together cocoa powder, flour, baking powder, baking soda, and salt. Set aside. In a large mixing bowl, beat eggs and slowly add 2 1/3 cups granulated sugar. Beat until mixture is thick and light in color. Add oil mixture to eggs, mixing until well combined; then gradually add flour mixture, being careful not to over mix. Once mixture is well incorporated, add grated zucchini. Pour batter into prepared Bundt pan, filling only about 3/4 full. Place pan in preheated 350 degree oven and bake for 50-60 minutes, or until toothpick inserted into the center of the cake comes out clean. Allow cake to cool completely in pan, for 20-30 minutes, before inverting onto a wire rack, plate or cake stand. 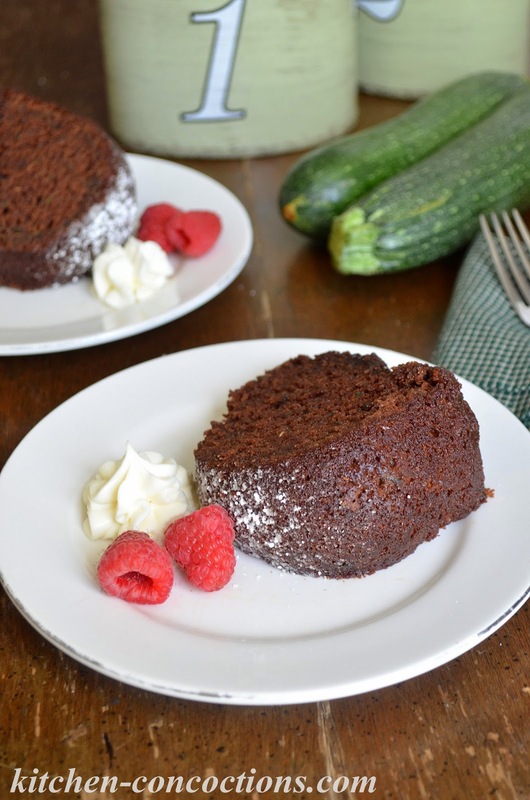 Right before serving, use a wire mesh strainer to dust the top of the cooled cake with powdered sugar. Serve cake with whipped cream and fresh fruit, if desired. Check out the calendar of recipes we will be baking from Lick the Bowl Good: Classic Home-Style Desserts with a Twist here. Here is my official review of the cookbook and recipe for Oreo Cheesecake Cupcakes. Buy the Lick the Bowl Good: Classic Home-Style Desserts with a Twist Cookbook here! Note: This post may contain Amazon Affiliate links which helps support Kitchen Concoctions. Thank you for supporting Kitchen Concoctions.